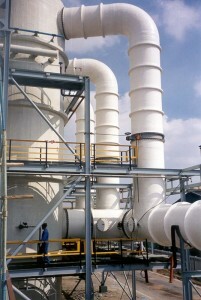 Fiberglass pipe is a superior material choice for many applications across a variety of industries. The member manufacturers on our site offer complete lines of pipe and tank products, some of which are specifically intended for certain projects, others are standard, and there’s always the option to customize. No matter the specifications, fiberglass products are corrosion-resistant and cost-effective, to name just a couple of the advantages. If you’re still using stainless steel or another traditional material, spend a few minutes on our site to see what the fiberglass alternative is all about. Fiberglass Tank and Pipe Institute puts forth strict guidelines for member companies. If you work with an affiliate supplier, you can trust that your fiberglass pipes will be safe, effective, and durable. Have your order delivered right to the jobsite and the rest will soon be history. Whether you work with motor fuel underground piping or an aboveground municipal system, you’ll find a distributor that can meet your demands. The fiberglass RTP industry has progressed considerably over the last 50 years. The advanced material is a solution that many industry sectors embrace. Other pipe products pale in comparison. Fiberglass is the green choice; it’s eco-friendly and friendly on your credit card. From a replacement installation to a new large-scale project, you’ll want to use nothing but fiberglass. There is no project too big, too small, too complex, or too rushed for fiberglass to not be viable. Even the most detailed application that requires large diameter pipes can be handled by these member companies. Customers around the globe are utilizing fiberglass because of its leading benefits. Fiberglass pipes are non-conductive, versatile, lightweight, and afford longevity of the system. Make the decision today to switch to fiberglass and your projects will be better for it. Our site is here to support you in that transition and thereafter. Let us know if we can be of service.